The daily cost of overstaying your tourist visa in Thailand more than doubled recently, with offenders required to pay 500 Thai Baht per day of overstay when they leave the country. Previously the daily fine was 200 Baht. (ThaiVisa.com has full details). Thailand issues a 30 day tourist visa on arrival for most nationalities when they enter the country, and if you should overstay for a couple of days, they will simply fine you the extra money at the airport as you leave. It’s a well-drilled procedure with little unpleasantness to it. However, even though immigration staff at the airport make dealing with an overstay fine a mere formality, if you are stopped by a Thai police officer in the street and found to have overstayed your visa, you run the very real risk of being imprisoned immediately. I’m not exaggerating here. Going to the airport and paying your overstay fine is technically considered to be surrendering yourself to the law – whereas being caught by a police officer is considered as being found breaking the law. This was starkly demonstrated recently when 12 tourists on a visa run to the Burma border to renew their Thai visas were stopped and subsequently arrested by the Thai police, forced to spend two days in a Thai jail and were then deported. (Read the full story on ThaiVisa.com). This harsh treatment was despite the fact none of them had overstayed for more than six days. Moral of the story – don’t overstay. 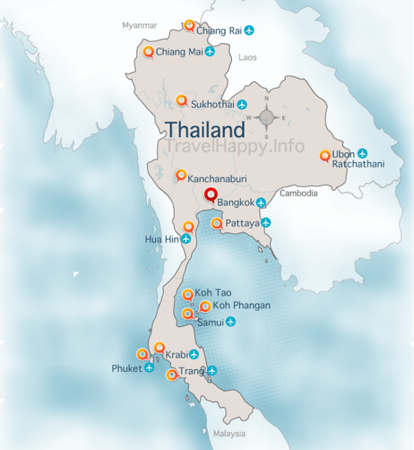 If you want to stay longer than 30 days in Thailand, either organise a visa run to happen the day before your visa expires, or ensure you get a 60 day visa from the Thai Embassy before you leave your home country.